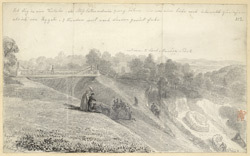 This pencil drawing depicts Lord Monson's Park in Reigate. The origins of Reigate can be traced back to the Norman Conquest, when land was awarded to William de Warenne, 1st Earl of Surrey in 1088. A castle was soon built here, and the town emerged nearby in the 12th century. Reigate was renowned for the quality of its sand and stone, which was used for the building of such major London landmarks as Westminster Abbey, St Paul's Cathedral and Hampton Court.